The paint pad is to be used for developing the photopolymer plates (solar plates) without damaging the soft surface. 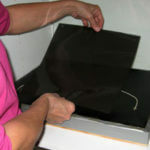 I have seen printmakers using a sponge for developing solar plates. Even the softest sponge is too hard for this purpose – a soft “painting cushion” or “paint pad” (like those used by painters) is the answer to this problem.